I’m back on the wagon – at least in the sense that I am once again copying Kelly’s awesome idea of creating a list of 30 Goals for the year 2015! 2015 is going to be a crucial year in my life, especially when it comes to my health and happiness. As some of you may know, I was recently diagnosed with Rheumatoid Arthritis. RA is an auto-immune disease that affects more women than men and symptoms can creep up at any age, though they often creep up between the ages of 30 and 60. I won’t get too into it, but if you’re interested in reading more about RA, check out the Arthritis Foundation. Though I think I have been handling this news and the initial treatment pretty well, I consider my RA to be a huge inconvenience. It’s also a great motivator to be more conscientious of my health and happiness… so a lot of my goals this year will reflect a shift in my extra-curricular activities. I hear making the bed on a daily basis plays a crucial role in overall happiness… though I’m a bit nervous about sticking with it. Did you make resolutions this year? Live in the present. Don’t wish away week days. With the new year underway, it’s time I revisit my list of 28 goals from 2013 to see how I did. Let’s see, shall we? Ok, I didn’t lose 30, but I lost 10, which is pretty exciting stuff. The most important thing is that I get myself healthy! Hollice and I saw La Boheme last year in January. It was glorious. On this one, I know it might not be fair to color it green because I didn’t do it in 2013, however, I bought my flight in 2013 (and we’re headed to Denver in February). This may never happen. Oakley is learning some helpful tricks though. She already knows if I say, “Bring me ____” what to bring me. I started playing again, but not as often as I would like. To be continued! This was done. I blogged about it too! Done in February! I even got my name changed on the certificate. So although I didn’t attend church as much as I should’ve, I did join a church and go on occasion. I am now a member at St. Anne’s Catholic Church in Barrington. I started out great on this but then I hurt my wrist, so I haven’t been at all in the last 4-5 months of the year. Hopefully I can resume sometime soon! MAJOR Done. I’m really proud to say this one is off my list forever! (15)Purchase all family members bday and xmas gifts on time and deliver them on time! I was doing so great until the end of the year. Let’s just say three of Eric’s family members got “Happy Birthday, Merry Christmas” presents. This is vague and hard to achieve, but I achieved quite a bit in 2013, so I’ll say it was done. I did – Fabulous Baltimore!! Granted it was for work, but I had a great time. I also blogged about this one! Ehhhh, if I asked my friends and family, they’d probably call this a fail. Although, I did send xmas cards this year, which is pretty thoughtful! I am up and running again – katedabkeyshoes.com (check me out!) and I did sell shoes! On the list for 2014! (22)Update all doctors, service providers to Barrington – doctors, hair, etc. Done! Well, except for my hair stylist, who I can’t leave because she’s been doing my hair for 10 years. I wouldn’t call this complete, but I did throw a lot away! I went to a White Sox game in April with Hollice and her husband, Kevin. Hopefully they play better this year. A Mystery? Yes, for you, readers it is! In 2013, I participated in a 5K (it was snowing!) AND gambled at a fundraising gambling event. More to come in 2014! (28)Listen more and Talk Less. Ask more Questions. Learn. Only 5 red ones – not too shabby! And what a year it was! How did you all do on your 2013 goal lists?! If you’ve been reading for a long time, you know the drill. Each year I set the number of aspirations that match my age in that year. Next week I’ll post how I did on my 27 aspirations in 2012. You’ll notice some similarities from last year which means I still need to work on them. Enjoy and share any goals you have for yourself this year. Here it is, plain and simple. No explanations today…after all I am already breaking my 1st aspiration! And because I’m a visual person I have color coded each aspiration to help me easily see how I measured up. Green means the goal was completed. Yellow is a work in progress and Red is a failure. As I completed this look back I realized it was easier for me to accomplish the aspirations that were specific and measurable. I think I’ll use that new knowledge for my next list. Have a Happy New Year everyone! Yay 2012! I guess you can say great minds think alike because just as Kate put up her post last night about vision boards I was getting to work on a vision board of my own. As I was brainstorming for my list of 26 aspirations, I stumbled across this blog post: Create your Own Dream Board by Shauna Stacy. I decided that if I am going to achieve all my aspirations I need all the support I can get. I am a visual learner so what better way than to see my goals in picture form every day? I tried to pick visually pleasing items because I plan I hanging this up in my bedroom where I’ll be seeing it everyday. Here is a close up picture so you can get a better idea of how it looks. Can you tell which pictures match up with the aspirations I posted last week? Small Update: Two days after I posted my 26 aspirations I was having lunch with a friend of mine. She was telling me how she really wanted to go see Les Miserables, but her husband was not as eager as her. She had already given up on seeing the play. When I heard about this, I cheered in my head and told her about my list and how number 22 is to ‘Go see a play I’ve never seen before’. All of a sudden we have a plan to go see the play in February. I wanted to share this small story as an example of what can happen when you keep your goals and aspirations at the forefront of your mind. In just two days I already have a plan to tackle one of my aspirations! First, I am reading the most wonderful book. It’s called, “Live it, Love it, Earn it.” This book is not only a great piece of advice for financial freedom and savings, but it is also a motivational and inspiring book for life achievements. 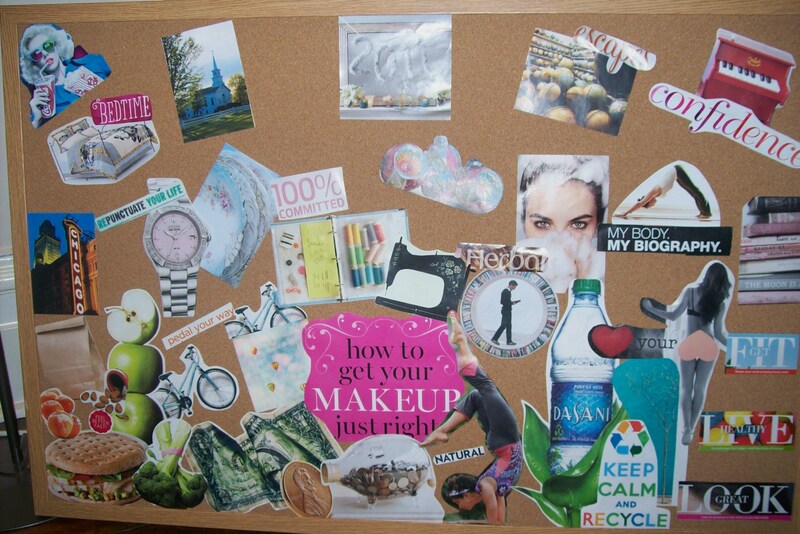 My favorite part is when you are encouraged to create a “Vision Board.” This board should contain pictures or memorabilia to represent all of your life’s goals. IT should be hung somewhere where you can see it often to remind you of what you are striving to be. 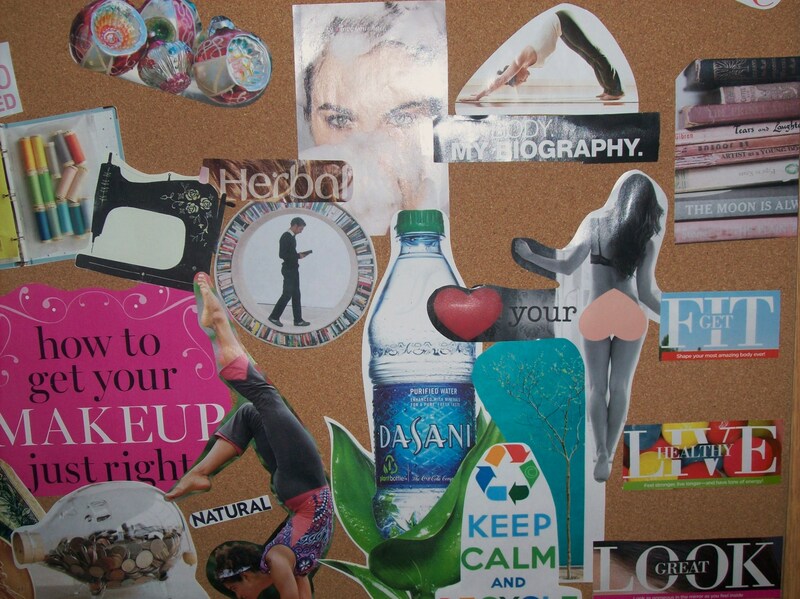 My vision board (yes, I took the time to make one) has a picture of my hunny, my family, some items to represent where I want to take my shoe business and my half marathon medal to remait fit and healthy. I highly recommend this book if you are looking for some inspiration to organize your goals and to strive to achieve them. Last week when I posted my resolutions, I had no idea how difficult it could be. Kelly even posted 26 of them! It’s difficult to remember everything I want to fix and dedicate a part of each day to each of my resolutions. I have, however, lost 6 lbs! There’s still more work to do, but it’s a start! Are you still keeping your new years resolutions?